A low FODMAP recipe for cottage pie using a beautiful array of root vegetables. 1 medium sized potato, pricked and rubbed with olive oil. 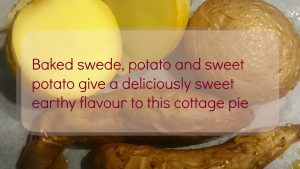 Bake the swede, potato and sweet potatoes in a moderate (180oC) oven for at least 30 minutes. Allow them to cool. Remove the skins. Process the swede in a food processor. Mash the potato and sweet potato in a bowl. Add the swede and breadcrumbs to the bowl, season if required and set aside to use as the topping later. In a pan, heat the garlic infused olive oil and add the beef. Once it has started to brown, add the carrot, tomato and soy sauce with the herbs. If it is very watery you can thicken the mixture with cornflour (I didn't need to though). Preheat the oven to 180oC. In a 20cm x 20cm oven-proof dish, spread out the beef mixture and spoon over the topping. Bake for at least 30 minutes and sprinkle over the cheese at least 10 minutes before finishing up.